The landscaping you have around your apartments should be attractive to your residents and potential tenants, but you also want to make it easy to maintain. Finding a balance between those two things can seem difficult, but there are several steps you can take to make it easier. Don’t feel that you need to have grass in every area of the apartment complex, especially if you’re located in a drier climate. There are plenty of ways to make landscaping look good without having to mow grass every week or two. The cost to water the grass and keep it weed-free and looking nice can be excessive, as well. 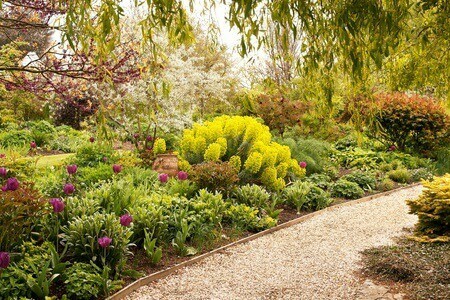 Instead of dealing with acres of lawn, have some flower beds, some gravel areas, and some areas that are filled in with mulch, bark, colorful rock, or another type of landscaping option that doesn’t require maintenance on a frequent basis. While you might have visions of a fancy, unique landscape, in most cases that’s simply not practical. It’s better to have a simple layout and design, that’s easy to mow and take care of. Otherwise, you’ll be paying far too much money out in landscaping fees and other lawn care costs, when you could have avoided that by making a simple design that wouldn’t require much work. A simple landscape often looks better, as well, even if your apartments are upscale. Going overboard simply isn’t necessary, and doesn’t work well in most cases. If you use grasses and plants that are native to the environment, you’ll be better able to care for them without spending a lot of money. Non-native plants require more water, different soil, and specific types of care routines that you won’t find with native vegetation. Anything that commonly grows in your area is already used to the type of soil and level of rainfall you have, so it won’t require any extra work to plant and keep alive. By doing some research into native plants, you can have a great-looking landscape for your apartment, and keep your maintenance difficulties (and costs) minimal. Having a regular schedule for maintenance is one of the most important things you can do to keep your landscaping looking great. Don’t wait until it looks bad to start working on it. Instead, make sure you maintain it properly right from the beginning. Then, it will always look nice and you won’t have to worry about a lot of time and effort spent all at once to make it look good again. Simple maintenance routines like mowing grass and pulling weeds are great ways to keep any apartment complex’s grounds looking great, with a minimum of fuss. Keeping costs low and appeal high is very important with any apartment complex or building, and that extends to the grounds around it, as well. Following some simple tips can help you make the right landscaping choices for your residents and your budget.